Ok with us trying to adopt a new puppy over the last month, this next book could not have come out at a better time for us personally. We are huge pet lovers and love adding to our family! Though this last round of attempting to do so has been a little tougher than previous times due to our move and some of the local rescue's. I think there is a certain bond between pet owners as we experience the odd personalities and actions of our furry friends who can't actually talk. Do NOT get me wrong though, my pets all communicate their feelings quite clearly with me. I feel like there is nothing more exciting than discovering that personality and how it fits into your family dynamic when you add a new pup (young or old) to your life! 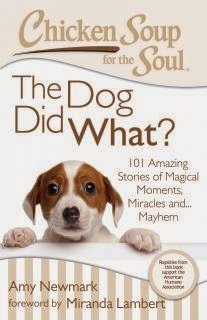 Chicken Soup for the Soul: The Dog Did What? synopsis says "Our canine friends make us smile every day with their crazy antics, their loving companionship, and their amazing intuition. 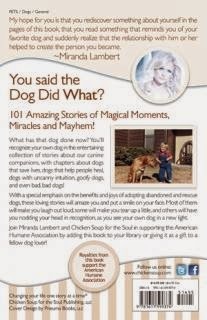 You will enjoy reading all the 101 heartwarming and often hysterical stories in this book about our canine companions and the magic they bring to our lives. This collection will make you laugh and touch your heart and after reading the stories we know you'll say, "The dog did what?". I loved the adorable stories throughout. I especially loved the one's I had yet to experience (and am glad to have missed, LOL). What a fun book for any dog owner and especially those whose pets truly are their children! Recommendation: I don't know that I would go and seek out this book if I hadn't been looking for something on the specific subject but this one still gave me the giggles. Giveaway: Chicken Soup for the Soul is going to give one of A Lucky Ladybug's lucky readers a copy of Chicken Soup for the Soul: The Dog Did What? of their own! We have 2 "mutts", Coco and Champ. Fluffy is my heart and soul, AND my bestie beastie (practical joker). I rescured her 4 years ago off the street in below freezing temps and we have been inseparable since. She just had a round of vet visits (heat-related seizures) and is now doing well. On my birthday yesterday she snuggled for hours. Ah, how sweet she is... Thank you Lord! We have had our German Shepherd, Brok, since he was a puppy. He will be 9 this year. Love him! Our hound dog is 5 years old. our dog is a mixed breed, she's part bull terrier and part stratfordshire terrier and part border collie, she's adorable and we have had her for nearly 3 months. we rescued her from a humane society after our other dog died from cancer. My Heidi is a mixed breed rescue dog. She's beyond adorable! I have three bull dogs- one is eight years old, one is six years old, and one is eight months.